A beautiful glow without the sun. 3 drops to sun-kissed skin! Liquid sunshine for your body. 4-6 Drops for sun-kissed skin all year round! For a streak-free tan and stain-free hands. Customized self-tanning — made for a man. Self tanners for face and body are extremely popular products for women looking to feel more confident in their skin and achieve a radiant and healthy glow – and for good reason. They deliver a rich, even, golden tan without having to put your skin at risk of burn or sun damage. The best self-tanning products are streak-free, natural-looking, and oh-so easy to use. Advanced, moisture-rich formulas leave your skin nourished, pampered, and glowing. They’re also a great way to get your skin summer-ready before hitting the beach. What is the best self-tanner for my face? Clarins has a range of self-tanning products to suit every skin type with results so true-to-you, you’ll love what develops. And you’re in control of your sun-kissed glow every step of the way with Clarins’ self-tanning innovations – try our Radiance-Plus Golden Glow Booster for Face, the perfect product for those who may be scared to self-tan. 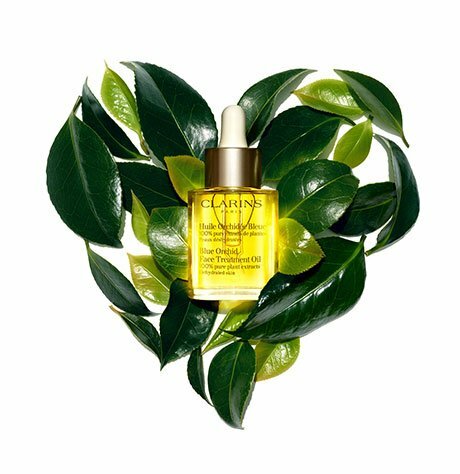 For best results, just add three drops to your Clarins day and/or night moisturizer to warm your complexion with a sun-kissed glow that gives you a gradual self-tanning result from first application. For a special occasion or if you’re after quick results, try a vitamin-packed self-tanner like Liquid Bronze Self Tanning for the face and décolleté. A sun-kissed result is yours in a matter of a few hours. What is the best self-tanner for my body? The best sunless tanning lotions should always give you a natural result with no mess, no streaks, and they should leave your skin soft and gently fragranced. Clarins Delicious Self Tanning Cream is a great example – its tinted caramel color means you can see exactly where you need more or less color, and Aloe Vera and Cocoa Butter treat your skin as your tan develops to a natural-looking golden glow. And the cherry on the top is its Cocoa fragrance that smells good enough to eat! You should settle for nothing less – whether you choose your self-tanner in mousse, lotion, or gel form. For an even tan, prep your skin with Clarins Exfoliating Body Scrub For Smooth Skin, and gently buff away flaky surface cells and impurities. Smooth on gently, in quick strokes, using a small amount at a time. When applying your self-tanner to the face, avoid the eyebrows and hairline. When applying your self-tanner to the body, wipe off the elbows, knees, and heels, which tend to soak up more color. Wash hands and nails thoroughly after application. Allow your self-tanner to dry before dressing. Re-apply as often as needed, to intensify your tan or maintain the glow. For best results, use Clarins’ reusable, waterproof Self-Tanning Body Mitt for a smooth, perfect, streak-free application of Clarins’ self-tanning formulas — without staining your hands. Can I control how light or dark my self-tanner will be? Yes, you can! Apply your self-tanner every second or third day to maintain your tan, or more often for a deeper glow. You can even add a few drops of your Radiance-Plus Golden Glow Booster for Face and Body to your normal moisturizer or regular body lotion for a customized tan all year round. Sunlight causes skin damage to all skin types so it’s advisable to wear a sunscreen or SPF foundation. Clarins’ range of men’s and women’s self-tanners for face and body, are the safest way to achieve a tanned complexion all year round, while still nourishing and protecting your skin from the long-term effects of sun damage. So, go ahead – treat yourself to radiant skin!